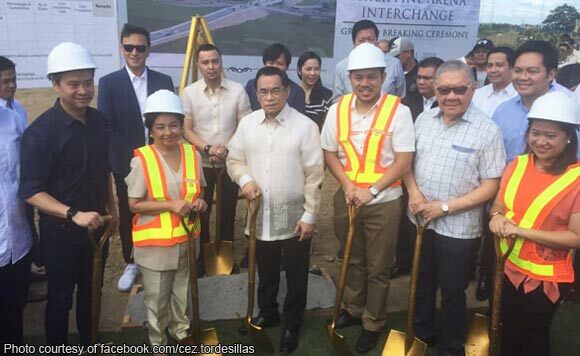 House Speaker Gloria Macapagal-Arroyo and local officials of Bulacan joined Public Works and Highways Secretary Mark Villar in the groundbreaking Friday of the Philippine Arena Interchange of the Northern Luzon Expressway. The event was held at the Ciudad de Victoria in Bocaue, Bulacan. According to the National Economic Development Authority Region 3, a four-lane road will be constructed connecting Manila North Road and the Sta. Maria – Bocaue Bypass Road, for P635 million. The project will bypass the heavily congested Gov. Halili Road via the Ciudad de Victoria, NEDA Region 3 said. “This project will serve as an infrastructure support and catalyst to further boost activities and industrialization in the road influence area, specifically to the towns of Sta. Maria and Bocaue, Bulacan,” Villar said on his Facebook page. “Upon its completion, travel time from the Manila North Road to the Bocaue Bypass road will be shortened from 50 to 15 minutes,” he added.